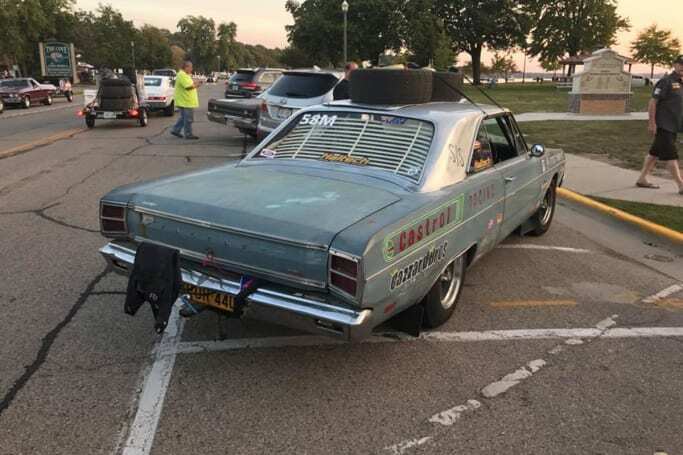 Competing in Hot Rod Magazine’s Drag Week event is about the most epic endurance challenge you can do in the sport of drag racing, combining five days of drag racing at four different tracks, with a 1600km road trip in said drag cars thrown in for good measure. To do it in a car you’ve shipped literally halfway around the world takes that to a whole new level, yet in 2017 there are once again teams from all over the world, including England, Finland, Sweden, and Australia! 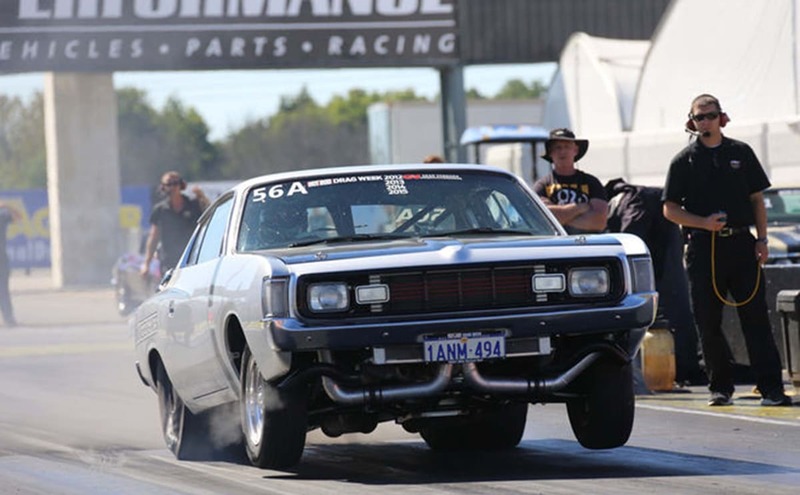 This year seven Aussies have turned up to run the event, and the fastest of the Australian contingent so far is Drag Week veteran John Farone in his twin-turbo big-block Valiant Charger. Farone has done a number of Drag Weeks in his silver R/T replica, and stopped the clocks on day one with a 7.37 pass to sit third in the Unlimited Class. With Tom Bailey's epic 3000hp, low-six-second Pro Mod Camaro now out due to a broken con rod, Farone will be one to watch in Unlimited if he can keep the Charger together and if Dave Schroeder’s Corvette has any problems. Harry Haig caused an internet sensation when he literally dug his '69 SS396 Chevelle out of the field it'd been left in for over 20 years, then ran it almost as-found in Drag Week 2015. 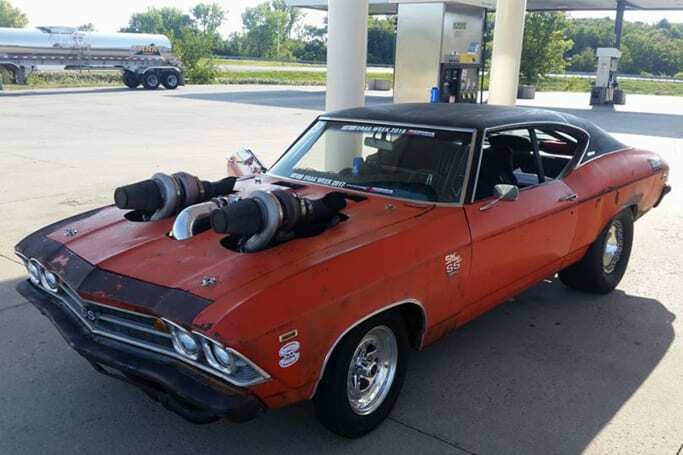 "Stevo The Chevelle" came back last year with a wild new twin-turbo big block set-up last year and, in 2017, is hunting 8.50s each day. Unfortunately the boys had problems blowing intercooler clamps and throwing drive belts on day one, recording a best of 9.0. 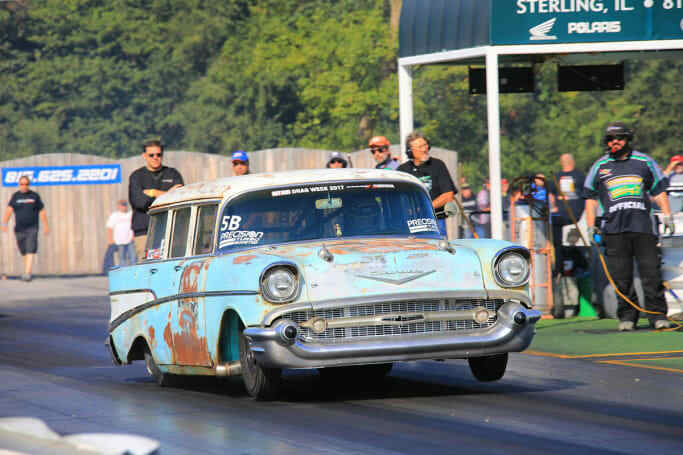 While his twin-turbo 6.0-litre '57 Chev wagon is no slouch having done a lazy 8.79 seconds at over 153mph, Richie Crampton’s day job is driving a Top Fuel dragster in the NHRA, and they can run 1000ft in under 4 seconds at over 350mph. Now a US citizen Crampton was raised in Australia and built the wagon from a $3000 wreck he found on Craigslist. Mark Arblaster is well-known in the street machine community for his epic WAR440 Valiant hardtop. Last year he built a POR440 sister car using a stock bottom-end 5.3-litre Chevy LS motor and huge turbo, and has shipped it to the USA for Drag Week 2017, even road-tripping it through 45 degree heat from Los Angeles to Illinois for the start of the event! He's had a few issues with alternators and overheating along the way, but it settling into a groove now, having run a 9.7 before hitting the road for the five-hour drive to the next strip for day two. It’s big, green and angry, but it isn’t Shrek! Craig Moar is driving the big G-body Buick and nailed a 9.7 on his first pass before packing up and hitting the streets for Gateway Motorsport Park in Madison, Illinois. 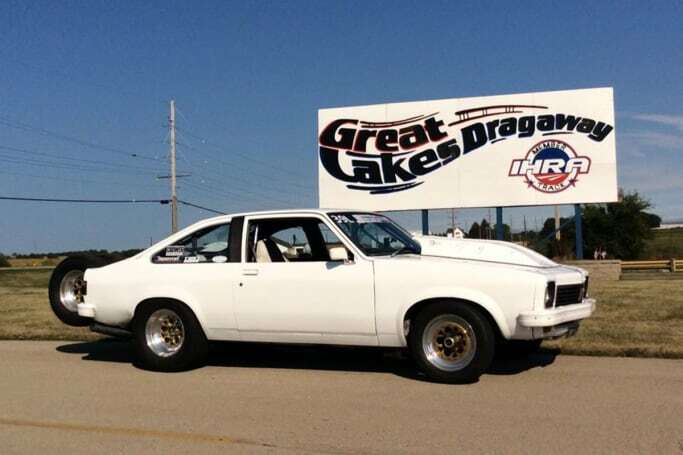 Brian Jensen’s white big-block LX Torana hatch is back in the USA for 2017, having blown a motor at the 2016 event. So far he nailed a 9.45 pass on day one and hit the road straight away. The theory behind the "run and done" move is to minimise the risk of breaking a part doing multiple runs, and giving yourself the maximum amount of time to complete the road legs, which are often four hours or more. 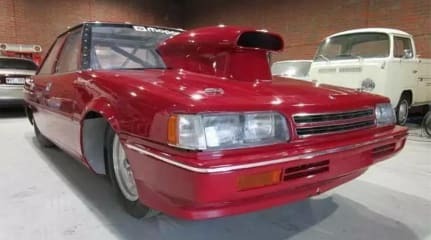 Jamie Farmer's XH Falcon ute runs a turbo Chev LS V8 but has had some set-up dramas, turning low-11-second passes so far. The boys are working hard to sort out the issues and hopefully they will have more success as the event runs. Iain Kelly is the hot rod behind The Creators Online. For daily updates, check out the Street Machine website as they have a crew on-hand following everything that is happening each and every day! If you’d like to follow the antics, the carnage and the good-times, check out HotRod.com, Hot Rod's Facebook page, or the Motor Trend On Demand app. What Aussie car would you take to Drag Week? Let us know in the comments. Introducing the Mitsuoka Orochi, Japan's so-called ‘supercar’. 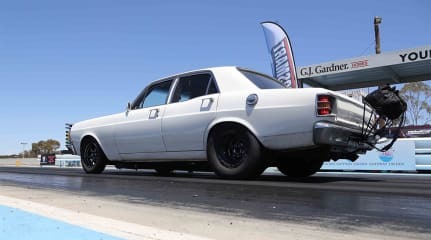 Most people would think the fastest street car in Australia is the latest hyper-machine from Koenigsegg or McLaren, but it is actually Frank Marchese's full-weight 1970 XW Ford Fairmont! Can a 2018 Audi S3 out-drag a 2008 Audi RS4? Turbo four-cylinder vs naturally aspirated V8.